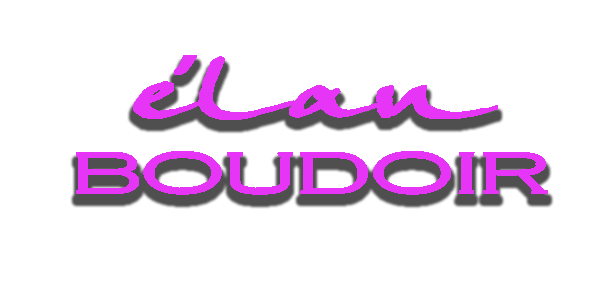 I want to personally thank you for visiting élan Boudoir. My work is my passion, and it shows in every aspect of the élan experience. Clients relish the ease and comfort they feel during their sessions and are in awe of their portraits when they see them. My mission is to capture the essence of each person. We work with all comfort levels. You just let me know what you have envisioned and we'll go from there. My goal is to bring out your true personality and make you feel as comfortable as possible! I would be honored to be your photographer! élan is pronouced (a-lan') in french means: "enthusiastic & distinctive style". When I decided to launch a photography company from my San Antonio based studio, my unique style and outgoing personalities made the choice of a company name seem clear. In April 2006, élan Imaging was born. I believe you'll recognize the love and dedication that I put into every one of my portraits. Quality and customer satisfaction remain my top priority! I want you to love your new élan portraits as much as I loved creating them for you. My name is Teresa Sandvig and I am originally from Montana, where I was born and raised. I attended the University of Montana (Go Grizzlies), where I earned her degree in Business Administration with an emphasis in Marketing and Management. I met my husband at the University of Montana. After graduation we moved to San Antonio, Texas together so he could attend law school at St. Mary's University. I have two children & am loving motherhood along with the new challenges that come along wtih it. I started doing photography professionally in 2004 and I have never looked back. I could not image myself being in any other profession! I love what I do and enjoys meeting a lot of unique people. I have met many great vendors and clients whom have become great friends. Before starting my own business, I had worked several years for two very well known photographers in the San Antonio wedding industry. I started Photography by Teresa back in 2006. I had been searching for that "perfect" business name and finally decided on élan Imaging. I want to thank everyone who has encouraged me to do what I love to do and for giving me the strength and courage in myself to go out and do it! I couldn't be more blessed with this opportunity and talent that I have I been given! I feel it is important to be a part of your community! I have volunteered my skills for several organizations in San Antonio. Artgives.org is an organization that is dedicated to keeping art in our children's education. I have also volunteered at the Humane Society taking pictures of the many animals needing homes, to help get them adopted. Thank you Teresa for your professional support and commitment to help ArtGives.Org document this years' Shakespeare in The Park event. It was a real pleasure to work with you. You have a very creative eye and a natural talent for capturing the moment. We greatly appreciate your contribution to help support arts education in San Antonio. On behalf of ArtGives.Org, we look forward to working with you again and wish you the best in all of your endeavors. Just in case you were wondering exactly how great the service you provide is, 18 out of the 23 animals you photographed and placed on the web have been adopted! Thanks for all your time and energy! !